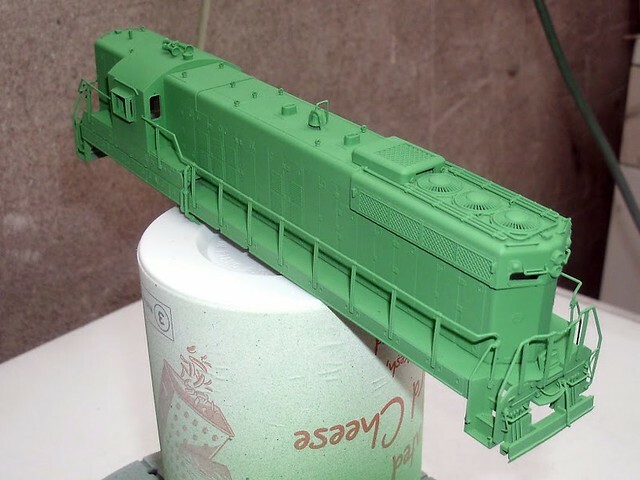 I found a cheap non-dynamic Southern RR Proto SD9 on eBay recently, and decided to do a quick-and-dirty upgrade to a Burlington Northern loco -the usual bodge of a few scratchbuilt and detailing parts, and don't look too closely. 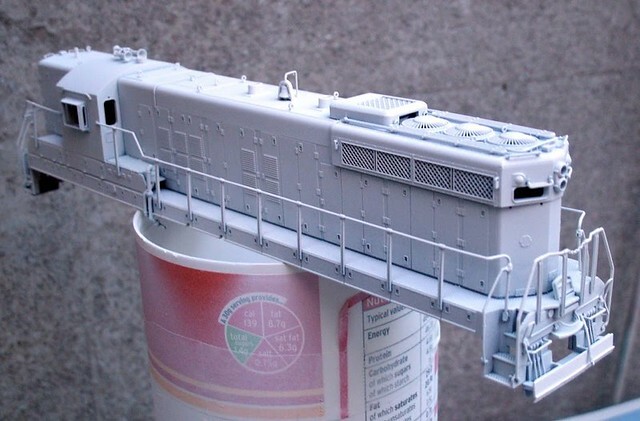 It will hopefully emerge as BN 6110, another long-hood-forward locomotive, to run at the club. I can't find any reference to a Proto BN non-dynamic model ever being released. It's since been sprayed BN green, and I'm not looking forward to the masking job for the black, but we'll see how it goes. Hi Brian, looking forward to this. (you should really have modeled another railroad with your Long Hood Forward likes ). igadget wrote: Hi Brian - nice little project.. I stripped it back to the bare plastic, John, and then I use Warhammer Skull White, straight from the big can, for the base coat. torikoos wrote: Hi Brian, looking forward to this. (you should really have modeled another railroad with your Long Hood Forward likes ). That's what I plan to do, Koos, but like all plans, they usually go awry. It's strange how almost "dayglo" the BN Green is. Helped to an extent by spraying it onto white, albeit in four thin coats. I'll let it dry thoroughly, put the masking tape on, spray another coat over the tape, and when dry, move on to the black. 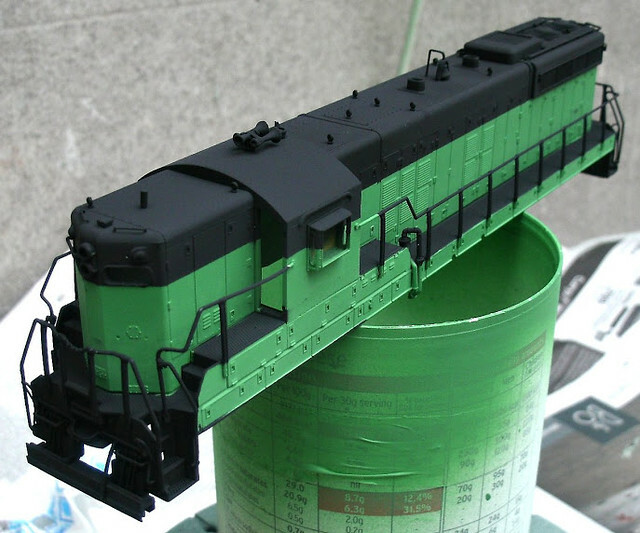 OK - quite a successful spray of the black, using Tamiya masking tape, and spraying a coat of the green over it, prior to the black. Hardly any bleeding, but there's a few small areas on the side walkways that'll need touching up with black. 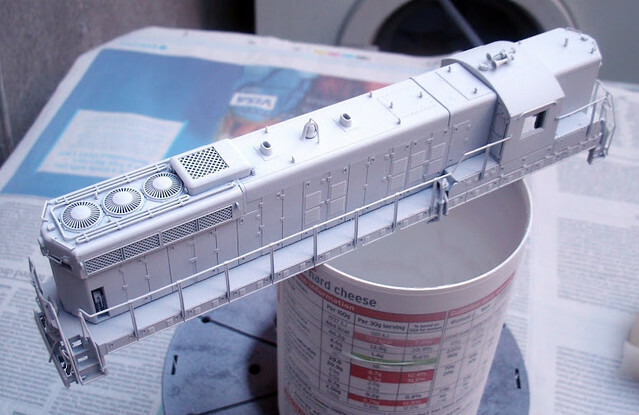 I chose not to remove the handrails, as I find that a pain to do, and something bad always happens - they will be painted green, probably by brush, along with some other touch-ups. Looking very good Brian, I am not sure why my paint attempt didn't work out as well, but I'm not too worried, practice makes perfect and next time I'm just trying again. BTW, I used Polyscale acrylic paints. torikoos wrote: Looking very good Brian, I am not sure why my paint attempt didn't work out as well, but I'm not too worried, practice makes perfect and next time I'm just trying again. BTW, I used Polyscale acrylic paints. hi Dan, yes I used a skewer to rub the edges, but I didn't use the gloss varnish trick. I did however, respray the masked paint one more go , but it was probably too light or too thin for a proper seal. 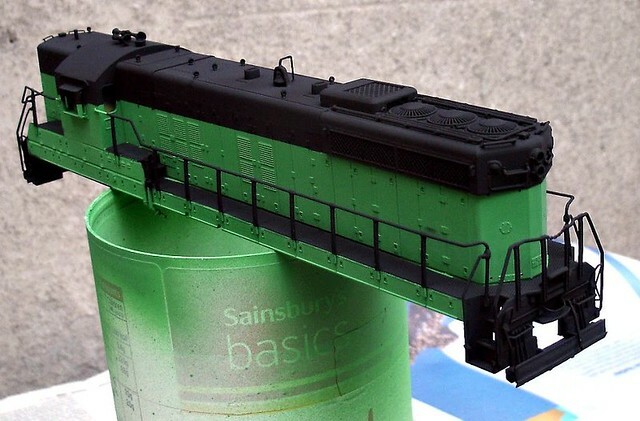 Oh well, I'll just have to weather the loco to mask some of the bleed on this one. Sounds more to do with the paint being too watered-down, and then sprayed on a mite too thickly?